Absorbine UltraShield Sport protects horses from stable flies, horse flies, house flies, face flies, horn flies, deer flies, mosquitoes and gnats. It’s sweat and weather-resistant formula stays active for up to 14 days and continues to work when the horse sweats and after rainfall. Kills and repels flies and mosquitos, including those that may transmit West Nile Virus. Water-based formula gives horses' coat an oil-free shine without attracting dust. Citronella-scented spray stays active for up to 14 days. I have eleven horses in the high desert in the middle of cattle country (lots of flies). This is the best spray I have found. It kills flies well. The active ingredient is Cypermethrin, which was recommended to us by Portuguese vets after telling them about our poor results with fly spray. They did not recommend more than 1% solution for direct spray. Cypermethrin comes in higher concentrations for use in stalls and barns. It has worked for us for four days. Do not believe claims of 14 days. Also don't forget to sponge the face of the horse. In southern Louisiana, we always have some type of flies on the trails. This product works better than anything else we've tried. Of the varieties of fly sprays I've used this year, the Absorbine UltraShield Sport is by far the most effective one against pesky face flies, horn flies, and those mean deer flies and green flies. My two horses both sweat a LOT especially in the humidity, and on all but their sweatiest rides, the fly spray still seemed to be working quite well. I do think the claim that it lasts for 14 days is rather dubious, but for your basic, everyday fly spray to keep your horse comfortable, this is the one for the job. Terrible. Smell made my horses cough. Made their skin itch and made them drop and roll to get it off. Dulls coat and tail. Dries out coat, make tail and mane hair dull and brittle. Bad stuf. .. I had to rinse off my horses to make them comfortable. Since I stupidly bought a gallon as replacement of a discontinued great product, I used a premise spray. Horses wouldn't go into run in when this stuff was sprayed. Also doesn't work- Mosquitos and horse flys laughed at it. Great alternative, easy to use, pleasant smell. My sister and I have Arabians, and they are known to be "thin skinned". We have been using Zonk It and have been looking for an alternative to use in conjunction with Zonk It. My girlfriend uses this product on her POA and her warmblood. I thought I would try it on our horses. The spray comes out as a fine mist once the pump gets fluid throughout the tube for the spray. We sprayed our horses and they had no adverse reaction to it. I would recommend this product. The BEST fly spray! Long lasting and truely sweat resistant! I started using this last summer, and I have to say it's very impressive. When you spray it on the flies won't even go on the horse. It's lasted through a 2 hour ride! It is definitely a good fly spray especially for anyone who's horse is doing heavy work. It's a little pricey, but it's worth it to make your horse bug free! When I spray this product on my horse flies will hover, not land on the horse, and leave. I have used fly sprays where this was not the case.The spray does work better than many other sprays that I have tried. It does last through some sweating. When the flies are abundant in the area, re-spraying is necessary. I tried Sport the other evening, and it actually repelled the deer flies for my entire 45 minute ride. I've never had a product work this well specifically on deer flies. It works better than other sprays for my horse. I love Mosquito Halt, but my mare seems to be developing a rash on her neck where I spray her with it. 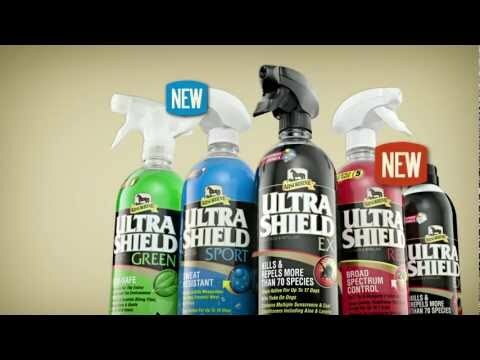 Ultra Shield is also a good product. I intend to try it to find out if the mare is less apt to break out from it. I like the red version. Hoping this one will stick better when my daughter has sweaty drill team practices. I feel that this sweatproof fly spray does help my horse. We have all kinds of bugs/flies at our barn and I have tried several different sprays and I have been happy with this one. Last longer than other sprays. I love Absorbine fly spray products and find that they seem to work the best. for the sport coverage when they sweat ! Because I was told it is one of the best fly spray products.